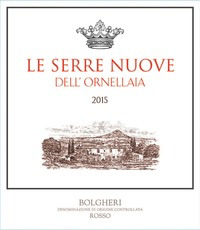 Wine Tenuta Ornellaia Le Serre Nuove 2015 - Royal Wine Merchants - Happy to Offer! The second wine of the estate, from slightly younger vines than his big brother Ornellaia 94 points Antonio Galloni - The 2015 Le Serre Nuove shows just how alluring this vintage is. Silky, perfumed and also wonderfully light on its feet, the 2015 is a real pleasure to taste today. All of the Ornellaia signatures come through in an attractive, mid-weight wine that will drink well right out of the gate. The 2015 is a stunning Serre Nuove. That’s all there is to it. This is a stellar set of current releases from Tenuta dell’Ornellaia and winemaker Axel Heinz. The 2015 Serre Nuove and Ornellaia both express the personality of the year beautifully in their totally impeccable sense of balance.